There’s nothing more critical during the summer months than dependable air conditioning. If your air conditioner is unreliable, inefficient, or downright unresponsive, we can help. Chas Roberts will quickly repair your air conditioning system without delay, so you’re never stuck in a hot home. While we’ve installed more than 85% of the air conditioning systems in Arizona, we also repair systems that weren’t originally installed by us. 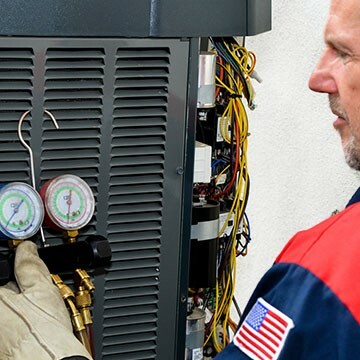 Our technicians are experts in delivering prompt service to create cool, comfortable environments. We understand you don’t control when your air conditioning or heating system takes a turn for the worse, so we offer 24/7 scheduling. Much like your air conditioning system, your heating system needs attention too. While most Arizona winters may not bring snow, the nights can get quite cold. If your home’s heating system isn’t working properly, give us a call. Chas Roberts has been installing, repairing, and maintaining air conditioning and heating systems since 1942. To better serve you, we take air conditioning service appointments in the evenings, on weekends, and even during holidays. Plus, we offer extended summer hours for emergencies. You’re moving soon—if you plan on moving soon, it may be a better decision to repair your system rather than replace. Sure, a new system can increase the value of your home, but you may not get everything you invest back. Wiring issues are one of the most common reasons for air conditioning unit repairs. This is especially dangerous in the Arizona heat and could be a fire hazard for homes. Improperly installed wiring may prevent the unit from receiving power and cooling your home. Refrigerant is an odorless, colorless chemical that can leak out of your unit. It may be difficult to detect without proper training. Although the chemical is nonflammable, leaks can still be dangerous. The most obvious sign of a refrigerant leak is often a harder working unit—you may notice your unit working harder to produce a normal amount of cold air. A rise in your energy bill is a common sign as well. The outside fan works to remove hot air from the home and the unit. In the heat of summer an air conditioning unit without a properly working fan can overheat in a short amount of time, potentially causing internal damage to the unit’s compressor. Inside each air conditioning unit is a coil. The coil contains Freon which cools the air pumped throughout your home. Units in need of repair may develop a frozen coil. This can be caused by many things, from an improper amount of Freon to a blocked air duct. Traditionally, A/C repair professionals view a frozen coil as an indication of another problem.